Alta is located on the famous Buffalo Ridge and is in close proximity to many Wind tower farms. 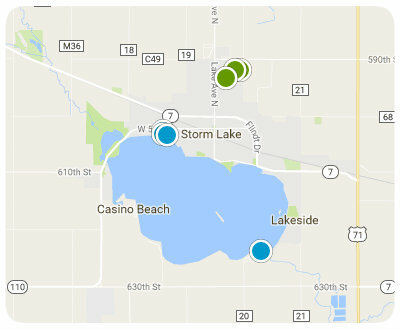 Alta is located close to Storm Lake and many people who work in Storm Lake live in Alta. Alta shares a school system with the community of Aurelia (town just west of Alta on Hwy 7), the Alta-Aurelia Warriors. The schools are a wonderful place young people can get a good education and grow into contributing members of society. Alta has an active downtown and several unique eateries including the Buffalo Ridge Cafe. The city also has a swimming pool, excellent baseball and softball fields, and a wood castle that was built by all volunteers. Located on the east side of town is a 9 hole golf course for those who enjoy a little gold, there is also another 18 hole course located in Lake Creek. The town has a very active community center, and community theatre. Alta also has the county fair grounds and the annual fair is a great time along with the Buena Vista Raceway that is open all summer. Just a short drive north and south of town and you will see many wind turbines that generate power for many households. Alta is located approximately 6 miles from Storm Lake, IA; approximately 1 hour from Sioux City, IA to the west and approximately 1 hour to the east is Fort Dodge, IA; and approximately 2½ hours from Omaha, NE; Sioux Falls, SD; and Des Moines, IA. Call Weaver Realtors 712-291-0118 we show all properties listed for sale in the Alta area.